Pioneer have entered the power meter market with an innovative system featuring an independent left/right power and pedal monitoring system. The Pioneer system is growing in popularity around the world and now supports 3 pro cycling teams including Marcel Kittel and Team Giant-Alpecin as well as many Pro triathletes. I've been trialling the Pioneer SGY-PM910H system with a Dura Ace crank, on my Giant Trinity. Power meter use is a hotly contended topic in the cycle/triathlon market, this review is far from a lesson in power meter use. I have owned a variety of power devices including Power Tap, Quarq, Stages and now Pioneer, all I offer is my insights to the usability of the Pioneer power system from an athletes' perspective. For more information on the Pioneer cycle products, visit the them at (http://pioneer-cyclesports.com/us-en/). Pioneer is the first power system to give us 'true' independent left and right power recordings, not the left/right balance estimation/totals like other power meter systems on the market. It does this by using 2 separate strain gauges, one fitted on the crank and one on the non-drive side crank arm. These separate power readings are recorded every 30 degrees of the pedal stroke and has the ability to assess not only power, but by looking at the force locations it gives you a pedal efficiency score based upon the balance of the left and right power readings across your pedal stroke, thus highlighting where power is generated or lost. In my opinion, having this data on where in the pedal stroke you may be stronger/weaker could be seen as a training tool to improving your pedaling efficiency, especially in longer endurance events where technique can be lost easily under fatigue. In my testing I also played a bit with this data to experiment with my TT setup to see if I changed my positioning if I would produce different wattage's on either leg. The Pioneer power meter is in its second generation of device, designed for Dura-Ace or Ultegra cranks, which is one of its perceived limitations. The full system retails for $1499 (incl installation from the retailer) and comes with a right side sensor fitted to the crank, a left side sensor on the left side crank arm and an adhesive patch magnet for either side of the frame. Unlike the first generation there is no need for cable ties to fix the units to your bike, making it look neat and tidy. You can also choose to set up the system with Pioneers head unit (cycle computer), which is advised if you want a good set of detailed readouts including pedal efficiency. You can use other ANT+ head units but it will limit the detailed data readings that the Pioneer system can offer (here is a sensor/ANT+ compatibility table from Pioneer (http://pioneer-cyclesports.com/us-en/products/sensor/compare.html). The set-up is a lot easier than first imagined, and reported by other reviewers (I tested the system on a Dura-ace 9000 crank with a unit that had already been attached). I fitted the crank and magnets without any problem and using the Pioneer head unit I calibrated it with the help of Pioneers' Youtube video clips. At the moment the Full Pioneer Pedal monitoring system is not compatible with some bike frames and brake caliper set ups. With a sensor each side of the frame and many bikes having varied brake caliper set ups, you need minimum clearance space for the crank to easily rotate either side. Pioneer sign off on sales of a full units knowing that it will be suitable for the bike after taking measurements and consultation with customers. Announcement of a right and left side only crank option (expected July in Australia), this meets the varied needs of users who may have fitment issues on their bike, but it also provides a more affordable price point for power meter customers not looking for dual readings (approx $799 AUS)! Updates to software and cyclo-sphere for increased usability and set up options with varied ANT+ devices. I spent my initial testing getting to grips with the Pioneer system and its setup to check everything was calibrated and working consistently. Understandably with 2 sets of power readings and pedal efficiency data the calibration and set up is slightly more difficult than pairing a Stages or Quarq, but I thought this was mainly due to the unfamiliarity with The Pioneer head unit. On understanding the various metrics of the Pioneer system and Pioneer Head unit (Pioneer SGX-CA500 cycle computer) my goal wasn’t to assess and validate specific power numbers (although they seemed to track fairly similar to my previous devices), but instead I tried to understand whether the Pioneer system's usability could be a piece of equipment that would work well to advance my training and racing if I or any other aspiring triathlete purchased it. *Note the Pioneer system power numbers tracked very closely with my Wahoo Kickr which was useful for setting training intensities. *The system has easy to use zero calibration protocols and if used with the Pioneer SGX-CA500 cycle computer it completes a left/right calibrates simultaneously on start up. I found the reliability and consistency of the system very good, which is a huge plus if you race and also a big selling point with so many systems on the market. I was impressed that even on 3 seconds power the readings weren't jumping about all over the place like some single sided systems I have used. One of my favourite aspects of the Pioneer system (although I'm not a data guru) is the data analysis the system can provide. 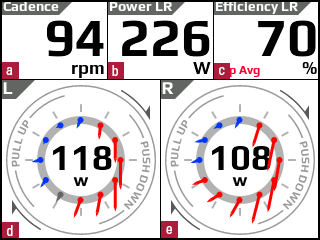 What the Cyclo-sphere software can give you is a complete readout of the usual power data you might expect with other ANT+ power systems, with the addition of the individual left and right power data, pedal efficiency scores and a range of options for graphs and readouts for comparison. Although the overview of the cyclo-sphere software is a little 'dated', you can't argue with the data you are presented with, and updates are constantly being made to improve. The system also has auto sync options with all your favourite training apps (Strava/Training Peaks etc). You can easily highlight laps from the workout, in this one below I did a sub-maximal effort followed by some short FTP efforts at higher cadence. I was attempting to look at the relationship of my power vs pedal efficiency at different wattage's and cadence. You can produce graphs to show the relationship if you find it easier to view that way. Looking at the overall efficiency and power for a particular lap (you can see below a higher wattage, higher cadence interval and my pedal efficiency was lower), I am producing a much higher wattage on the down stroke, which in turn places emphasis on a lower upstroke. More importantly I noticed a couple of dead spots in my pedal stroke here which is something that I could focus on. To an extent this trend is something that you might expect, but highlighting this data can give greater focus for future improvement and monitoring of improvements. The Full Pioneer Power and Pedal Monitoring System is definitely designed and marketed with the more tech savvy power user in mind and with experience in the power meter market I found the set up surprisingly easier than expected. The announcement of the single sided Pioneer Power system also makes it very appealing to first time or athletes or those with frame clearance issues. You can be extensive with your analysis of the Pioneer power data, BUT it can also serve to work as a normal power meter (especially the single sided system). Having used other power meters, the 2 main benefits I see of this system would be (1) the consistency in the data performance and (2) use of the pedal efficiency metrics to try to improve weaker parts of my pedal stroke which is not realistically monitored with other systems. "At its competitive price, the Pioneer system has to be on the radar for your power meter purchase"
Recently DC Rainmaker published his usual, high quality and in-depth review of the Pioneer system, including specific details on power data accuracy and comparison if that is what you are specifically interested in about the system (http://www.dcrainmaker.com/2015/05/pioneer-system-review.html).